This refreshing sorbet makes an elegant end to a summer meal. Scoops of papaya-peach sorbet and a zingy dose of freshly squeezed lime juice is packed with antioxidants. 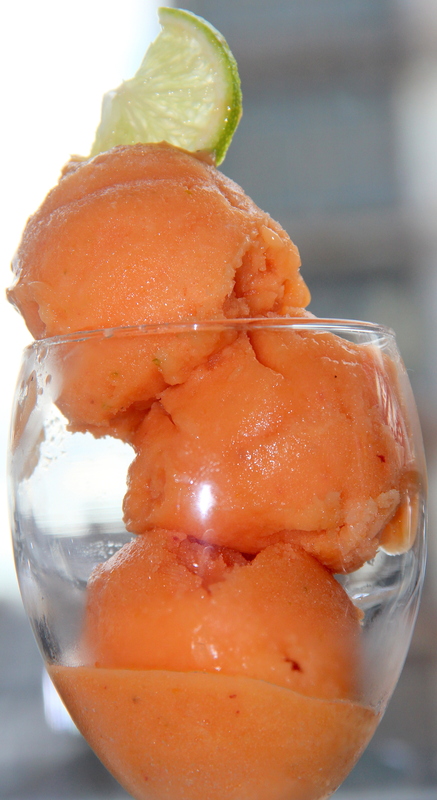 Sorbet is a frozen confection similar to ice cream, but made without any dairy products. Instead, the dessert is made with sweet syrup made of sugar and water and flavoured with fruit juice or puree. The same method used to make ice cream is used to make sorbet. The syrup and fruit churns in a refrigerated machine that mixes air into the ingredients and forms fine ice crystals to make the sorbet smooth. Line a large baking tray with parchment/wax paper, arrange diced papaya and peach in a single layer and freeze overnight. Then transfer frozen papaya, peach, honey, coconut milk, lime juice and zest in the food processor/blender and pulse until smooth, stopping to scrape down the sides and stir as necessary. Transfer the sorbet to the serving bowl and serve immediately or freeze until ready to use. Posted on August 25, 2014, in Indian, Sweets, Vegan and tagged Chitras healthy kitchen, drchdietfood, Healthy fruit sorbet, Vegan recipes, Vegan sorbet recipe. Bookmark the permalink. 39 Comments. Delicious and so easy love this sorbet! Oh wow watermelon sorbet sounds nice. ….look forward to it. ….here summer is nearly ending, started raining so…..
my favorite fruits.. bookmarking this..
What a delicious looking summer treat! Agave nectar and coconut milk are new ingredients for me to make sorbet. Papayas & Mangos do like peaches, and limes make the whole thing dance. Do i hear a bit of grated lime zest for contrast, and ginger for se-e-exiness! Pomegranate seeds, coconut cream, & wee Krumkake serving cups …. ooh, i could get carried away!